When asked about the best time to visit the Pryors to see the horses, I almost always answer August as it is the most reliably warm and dry month. I take it all back! As we drive up Crooked Creek Road, Stephanie Von Fange, our new Cloud Foundation intern and I have high hopes. Twin fawns, their white spots beginning to blend into their cinnamon brown coats, forage in tall grass under mostly cloudy skies. Stephanie spots a young black bear that darts into the woods before I can get my eyes on it. When we drive to the spot where the young bear was foraging, I notice the ripening raspberry bushes that had drawn the bear to the road. August seems premature for the berries to be ripening, I think to myself. 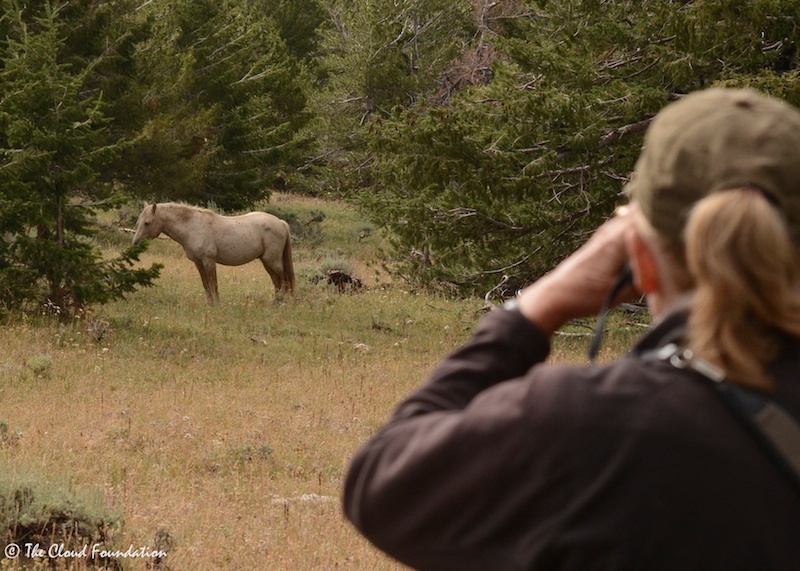 Once we are in the horse range, we begin looking for horses on the open sub-alpine meadows. Unlike July, the horses are nowhere to be seen so we drive downhill a bit on Tillett Ridge and Stephanie spots Encore, Cloud and Feldspar’s daughter, in the limber pines. The nearly white yearling filly forages near Knight, her four year-old stallion. For a moment I believe that Inali and London have finally left the two young horses alone, but then we see the two bachelor stallions grazing deeper in the trees. I find myself sighing in disappointment. When will this drama end? Encore looks fine considering the heartbreaking separation from her family and her new-found life with competing bachelor stallions. Brave little girl, I think. Tough and brave. Never imagining this will be our only chance to photograph the striking filly, we drive on, hoping to get a handle on where the horses are hanging out. At the snow-fed waterhole we find Garcia’s band. Garcia and Greta’s three offspring are like stair steps. The oldest, two-year old Marlene, is a stunning coyote dun while her younger siblings are a rich black-brown. The snow has long since melted here, but ample rainfall has kept the pond over half full. Finding no horses anywhere else, we return to the waterhole late in the day, as the sun dips below the clouds, bathing the meadows in golden light. Here too, there are no horses. But disappointment quickly evaporates as we hear thundering hooves behind us and turn. It’s Galaxy and his band with Electra in the lead. In the distance Doc is also coming with his big band. Okomi is growing tall and has roaned out but retained his dorsal stripe. Then, just before sunset, Phoenix, Cloud’s 23 year-old mother, leads Hernando’s band to the waterhole. As we sit quietly, we can hear every sound—every snort, breath, and footfall. The wondrous evening was to be the only calm and clear one we would have on our five-day journey. During the night it rains and the temperature dips into the forties. Cold for August, I tell Stephanie the next morning as we watch a herd of handsome mule deer bucks near our camp. Again the horses are nowhere to be found on the sub-alpine meadows. However, our hikes into the forest on upper Tillett Ridge produce results. It begins to rain as we find Flint and Doc’s family. Firestorm’s son and Cloud’s grandson, Okomi, is leaping over sage and running boldly up to Flint’s mares, enjoying the cool weather. A quiet hike deeper into the rain drenched forest, produces a sighting of young Jasper, Flint and Feldspar’s son, with his mare Demure. Jasper is wolfing down the leaves of the Heartleaf Arnica flowers. The silence is regularly broken by red squirrels blurting out their rat-a-tat warnings to other squirrels. The small tree dwellers must defend their middens, places on the forest floor where they stash the cones that will carry them through the coming winter. It seems early in the year to be so busy collecting cones, I think to myself. We drive over to the other side of the mountain and find Bolder in the rainy limber pines of upper Sykes. Echo is still claiming his father’s mare, Cedar. Although we witness no fighting, we can see the many cuts and scrapes on the young palomino’s coat. Kick him out Bolder, I think to myself as we return to the Durango. Just before sunset above the teacup bowl, a few minutes of sun illuminate Indigo Kid’s new family. Indigo defeated Cloud’s brother, Red Raven, to claim the band led by the red roan for 14 years. The rains come again during the night, turning the roads into a slip and slide. The cold is sapping our camera batteries. Not to mention, driving around to find horses is using up our gas. If the rain persists, it will be impossible to get off the mountain safely. In an instant, our worries are forgotten. 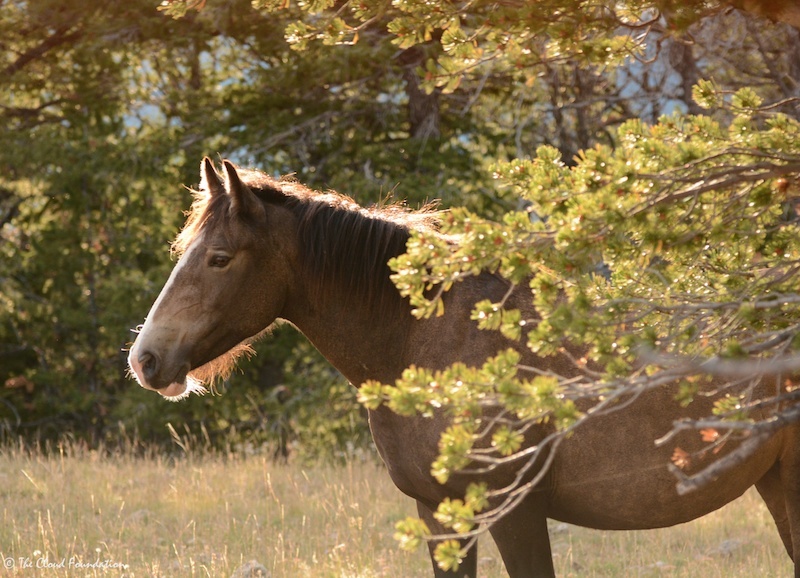 We find seven bands of horses on upper Tillett Ridge in the pines, including Cloud, Ingrid, Feldspar and Ohanzee. As we begin filming, we hear what could be a UTV driving up the road. Garcia’s family is above us and the stallion walks toward the noise. He stops and then snorts a warning. Literally, every band begins running in unison. They don’t stop until they are beyond Penn’s Cabin, as far away as they can possibly be without dropping off the mountaintop, and onto Sykes Ridge. As we crest the hill beyond Penn’s Cabin we see over 50 horses in the small meadow on the other side of Sykes Road. I wonder at their behavior. Strange. Have you been chased by a vehicle? I silently ask myself. 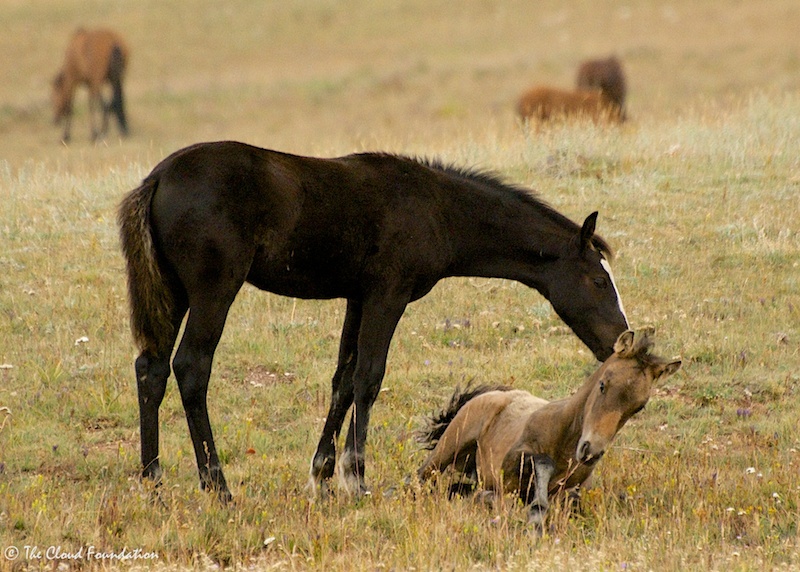 The young horses seem to enjoy the close proximity of the bands, using the situation to interact with other youngsters. Ohanzee is the most outgoing foal, at least on this particular day, first visiting Oro in Galaxy’s band. Although much younger than Ohanzee, Oro does not back down when the tall black colt gets a bit rough. Only when Limerick, Electra's three-year old daughter, takes Ohanzee to task does he seek out other playmates, moving on to Odakota and Outlaw in Duke's band. When Duke tells him to get lost, he runs off to play on his own, using a well-worn limber pine as a scratching post. When Feldspar calls for him, the lively colt races home. Cloud is looking well and is his feisty self, trotting up to Galaxy. He reminds the young black band stallion that he is too close and should move away. When Cloud returns to his little family, he grooms for a long time with Ingrid. Is she pregnant or not? I wonder. A Cloud baby and a companion for Ohanzee is exciting to think about. 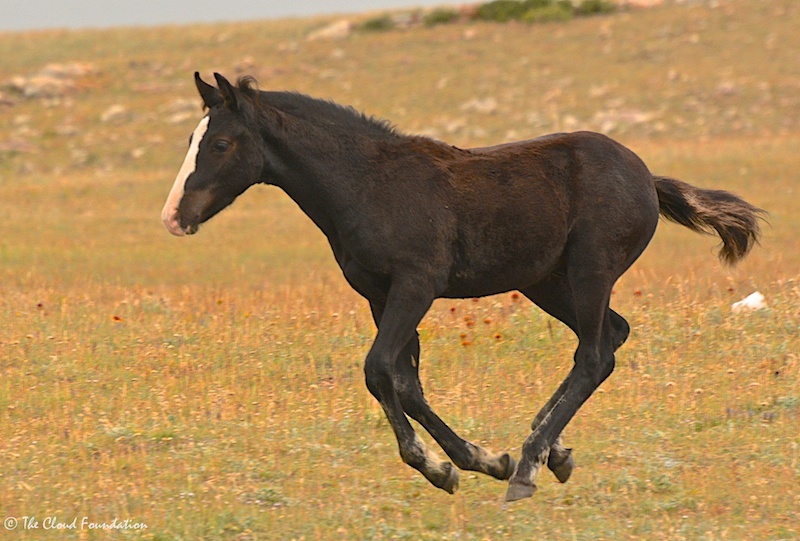 However, a fall birth is dangerous and both mother and foal could be in jeopardy. Ingrid has had only one foal and it was when she was just a two-year old. I believe the weight of the foal she carried when she was still growing herself caused her topline to permanently sag. She loved to play with Mato Ska when he was a baby. Where is Mato Ska by the way? I ask myself. We had caught fleeting glimpses of him running through the limber pines with Grijala, followed at a leisurely trot by Mandan. He is living the carefree life of a bachelor. I remember how playful Cloud was as a two-year old, with his fun-loving band of young stallions. When we decide to drop off the mountain and go into town for gas and charge our camera batteries, I never imagined that the weather would prevent us from returning the next day. Heavy rain is falling as we drive out to the horse range. The wet road up Tillett will be far too dangerous, even in the UTV, so we make the most of our day in the low country. 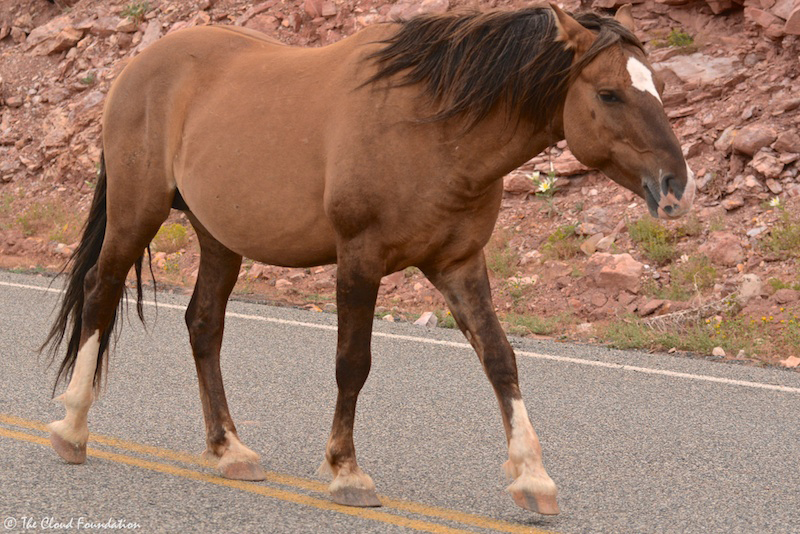 We had seen Fool’s Crow, Hidalgo, Fiero and Hidatsa’s bands along the road on our first night when we arrived in Lovell. Today we spot Fiero again with little Oregon. 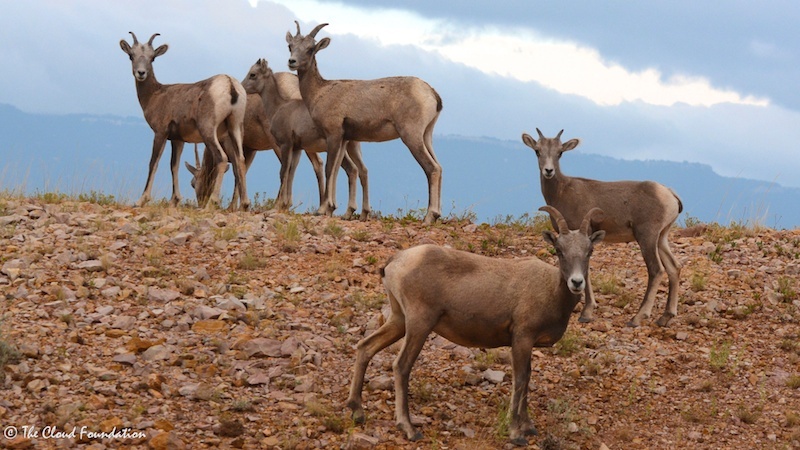 We see not only horses but bighorn sheep ewes with their lively lambs and yearlings. The next day the mountain is still socked in on top, but the roads have dried out enough to make them passable. Have the bands dropped down to the lower elevations? I ask myself. I hope so because getting to the top will likely be impossible. This will be our last day and we want to try to find Encore and to see the two bands we have not seen, Custer and Casper’s (Cappuccino). We glass along the way with no success and climb onto the ridges of Tillett. Still no horses. As we climb higher into the deep forest, it begins to rain. Then the rain grows thick before it turns to icy snow! In August? I say out loud to Stephanie, I have been here in August for twenty years and have never seen it snow! In the limber pines we park. The road above us is a muddy river. We begin hiking and spot Indigo Kid and his band. They are standing on the lee side of a dense stand of pines with their rear ends up against the protective branches. We hike on and see Hernando and his family with Phoenix. The palomino mare lifts her head and eyes us warily before moving away. We make a wider circle, take a few more pictures and retreat to the car. After driving downhill, perhaps only a half mile, we are again below the snow line. The rain has stopped and we park the Durango on the hill where I first saw Cloud coming through the forest with his family 19 years ago. Stephanie and I split up, hiking to try to spot horses. Within minutes I see movement in the trees about 100 yards to my right. Two duns! I hustle back to tell Stephanie and we hike together to find the horses. It is Flint and his family. The handsome, little grullo roan stallion is standing still as a statue, listening to something. I listen with him but can only hear a distant squirrel and the light wind. As we take pictures of Flint and Halcyon’s little daughter, Olivia, with her brother Miguel on her heels, I hear an engine--either dirt bikes or an ATV. 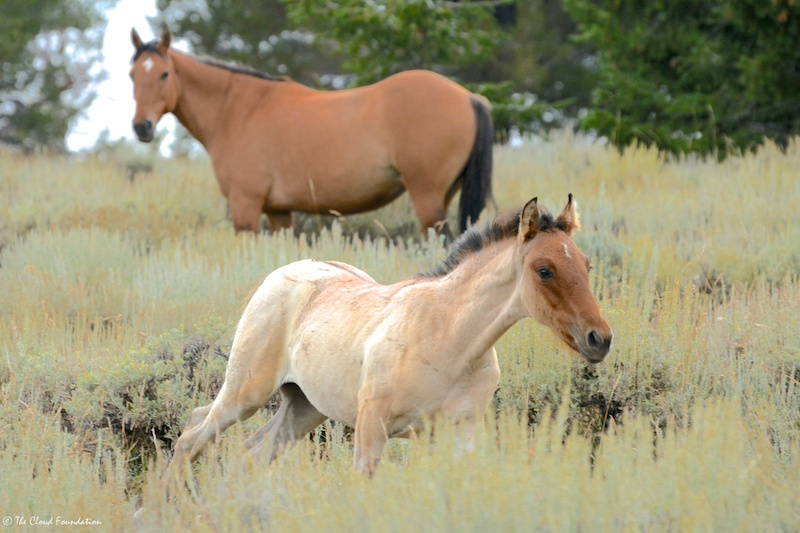 Above us, we notice Baja and his family with their tiny foal--the newest member of the Pryor herd. They too are listening to the noisy engine. Then we spot Knight’s head popping up from above a hill beyond Flint. Stephanie says that she can just see the top of Encore’s head. Great, I whisper, imagining a chance to photograph Cloud and Feldspar’s beautiful filly. Suddenly the bands take off running in unison, racing downhill toward the Hell ‘n Gone near Crooked Creek Canyon. Just like the other day, they run from the sound. Someone has been chasing them, I tell Stephanie. I’m pretty sure of it. There is no way to follow where they are going. We glass on the way down the mountain but see no horses. Clark’s Nutcrackers industriously collect pine nuts. Bluebirds flit from juniper to juniper. A red tail hawk flies from a Douglas fir soaring over Big Coulee. In the low country, turkeys with their young forage in the tall grass and wildflowers. What a wonderful, wild, unpredictable place, full of surprises--including snow in summer. PS. 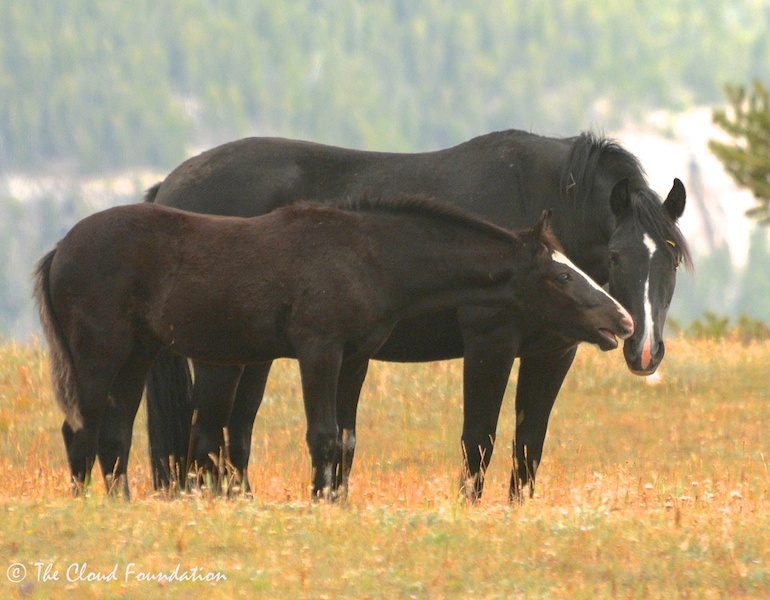 Thank you to everyone who has helped keep the wild horses of the Pryor Mountains roaming free. 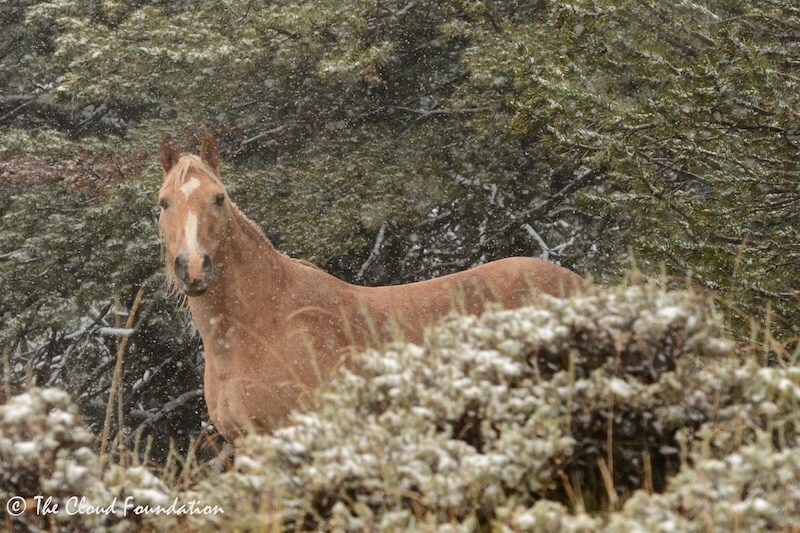 Please consider donating towards our legal challenge to keep the mustangs of Southern Wyoming roaming free with their familes, please do so now. Thanks so much!